SOFTEAM released the SoaML Designer module as an open source for the Modelio 1.2. You may find below the download information. The SoaML Designer implements OMG SoaML 1.0 beta 2 standard. The prototype is compatible with Modelio FREE 1.2, however it is recommended to try it with Modelio Enterprise Edition. Download and deploy SoaML Designer module from the SourceForge. Check the User's Guide for more information. Check also the SoaML Tutorial page for detailed information. Extras: SoaML and BPMN to Web Services and BPEL transformation. You may want to download from the SoaMLEngine the SourceForge . This module adds a transformation feature from SoaML to XSD, WSDL and BPEL. 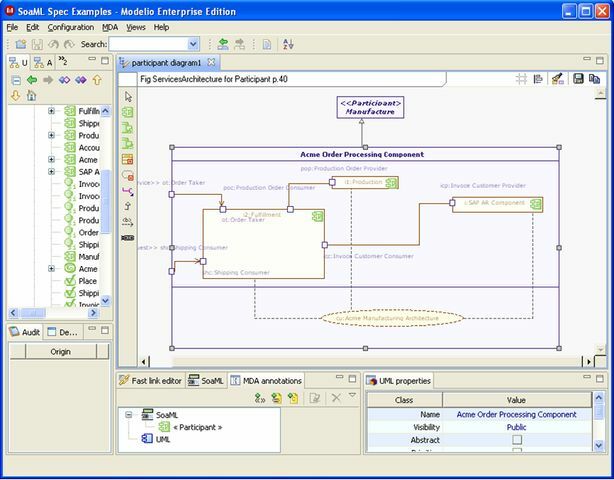 Note: You'll need to deploy BPMN, XSD, WSDL and BPEL modules to make it working, which are available with Modelio Enterprise Edition only.